Explanation: Have you ever seen the Man on the Moon? This common question plays on the ability of humans to see pareidolia -- imagining familiar icons where they don't actually exist. The textured surface of Earth's full Moon is home to numerous identifications of iconic objects, not only in modern western culture but in world folklore throughout history. Examples, typically dependent on the Moon's perceived orientation, include the Woman in the Moon and the Rabbit in the Moon. One facial outline commonly identified as the Man in the Moon starts by imagining the two dark circular areas -- lunar maria -- here just above the Moon's center, to be the eyes. Surprisingly, there actually is a man in this Moon image -- a close look will reveal a real person -- with a telescope -- silhouetted against the Moon. This featured well-planned image was taken in mid-January in Cadalso de los Vidrios in Madrid, Spain. Do you have a favorite object that you see in the Moon? Can't say I've ever seen that particular version of the man in the Moon. It's an interesting one... I'll have to see if I can envision it next full Moon. In Shakespeare's Tempest there is a reference to Caliban being taught to see "The Man in the Moon, and his dog, and his bush". I'm more familiar with the Irish notion of seeing a Hare in the moon. I have a fond suspicion that this is related to the superstition that one should say "Rabbits, rabbits, rabbits" on the first of the month. (One must recall, but not mention, the presence of the sacred animal.) This Hare is sacred to the Moon Goddess, and even has a name: "Gearr" --which, if my lame Irish is correct, means "Shorty". Ever since I was young I was shown the Rabbit in the Moon and ever since it has been a challenge to see anything else. to see "The Man in the Moon, and his dog, and his bush".
. thorn-bush, my thorn-bush; and this dog, my dog. This is odd, since the play is to be given at Theseus' wedding and Theseus himself has said it will take place on the night of the new moon, which means there will be no moon in the sky. But it really doesn't matter. Even if there is no moon to shine naturally upon the stage, Quince has an alternative. and say he comes to disfigure, or to present, the person of Moonshine. A man holding a lantern on high is an obvious representation of the moon. But why a bush of thorns? The vague shadows on the moon's face, visible to the naked eye, are the marks of the "seas," relatively flat circular areas surrounded by the lighter cratered and mountainous areas. In the days before telescopes, the nature of the markings could not be known and an imaginative peasantry concerted the shadows into figures; most commonly the figure of a man. This was the "man in the moon." Somehow the feeling arose that the man in the moon had been hurled there as a punishment and the particular crime was thought to have been described in the Bible. The crime took place when the Israelites were wandering in the wilderness on their way to the Promised Land. Numbers 15: 32-4: And while the children of Israel were in the wilderness, they found a man that gathered sticks upon the sabbath day.And they that found him gathering sticks brought him unto Moses and Aaron, and unto all the congregation. And they put him in ward, because it was not declared what should be done to him. THESEUS: let us listen to the moon. DEMETRIUS: He should have worn the horns on his head. should be put into the lanthorn. How is it else the man i' the moon? for, you see, it is already in snuff. HIPPOLYTA: I am aweary of this moon: would he would change! in all reason, we must stay the time. <<Meanwhile another pair of individuals are to be found wandering on the island. Trinculo, the King's jester, has escaped and is wandering aimlessly. So has Stephano, the King's butler. Caliban sees Trinculo approaching and, in terrible fright, pretends he is dead. Trinculo finds him, doesn't know what to make of the half-human monster, but crawls under his garment to stay out of the last dregs of the tempest. … This is a devil, and no monster. I will leave him; I have no long spoon. Stephano refers to the proverb which is usually quoted, now, as "Who sups with the devil must needs have a long spoon." Thou art very Trinculo indeed! of this mooncalf? Can he vent Trinculos? A mooncalf is the name given to the occasional deformed calf born of a cow, because this was thought to be due to the malign influence of the moon (see page I-629). Eventually, the expression came to be used for any monstrous form of life. Apollo 11 landed in APOD's Moon Man's left eye. Explanation: Have you ever seen the Man on the Moon? This common question plays on the ability of humans to see pareidolia -- imagining familiar icons where they don't actually exist. One facial outline commonly identified as the Man in the Moon starts by imagining the two dark circular areas -- lunar maria -- here just above the Moon's center, to be the eyes. Surprisingly, there actually is a man in this Moon image -- a close look will reveal a real person -- with a telescope -- silhouetted against the Moon. I happened to run across a copy of this when a teacher at my wife's school found one and knew I'd be interested. It shows "Proposed Apollo Landing Site 1" in Mare Tranquillitatis and many of the others places which became famous. Copies seem available pretty cheaply for those interested in map history. It was fun to look back at a point in history when it hadn't been made yet. Those eyes are way to close together and unsettling! 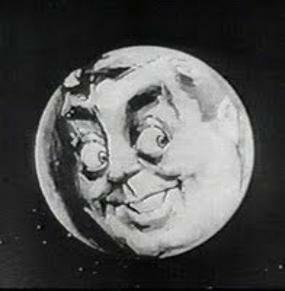 I was never able to see any sort of man in the Moon until Carl Sagan pointed one out in The Demon-Haunted World. I'm not sure I could see it today. When I was a kid, I read a book illustrating the face, but all I ever saw was a rabbit. A few years ago, someone gave me an explanation. We live in the tropics, and the Moon rises at a tilt such that the rabbit is oriented properly, but the face is lying on its side. Of course, these pareidolias occur when the Moon is full, moonrise is when the full Moon is most accessible. Cousin Ricky wrote: A few years ago, someone gave me an explanation. We live in the tropics, and the Moon rises at a tilt such that the rabbit is oriented properly, but the face is lying on its side. Of course, these pareidolias occur when the Moon is full, moonrise is when the full Moon is most accessible. Why? Personally, I see the full Moon much more often when it is high in the sky than I do at its rise. Seems like accessibility is a matter of personal circumstance. It's definitely a rabbit/hare in profile. Like those: http://pngimg.com/download/3779 or http://www.gettyimages.com/detail/photo ... /106305500. Where? See e.g. image posted by user Neufer. Mare Fecundatis as head, Langrenus crater as eye. Mare Tranquillitatis as front half of the body, Mare Serenitatis as back half of the body. Mare Vaporum as hindleg, Mare Nectaris as foreleg. The similarity to silhouette of rabbit depends somewhat on libration, too - when Mare Crisium is closer to the lunar limb, it resembles more ears of a rabbit/hare. Last edited by neufer on Mon Feb 01, 2016 6:48 pm, edited 1 time in total. Tks, APOD, for bringing "The Woman in the Moon" to people's attention -- something that once you've seen her, you can never forget. Guest wrote: Tks, APOD, for bringing "The Woman in the Moon" to people's attention -- something that once you've seen her, you can never forget. Rain follows the full and new phases of the moon. <<Zuni Indians thought a red moon brought water. 17th-century English farmers believed in a "dripping moon," which supplied rain depending on whether its crescent was tilted up or down. Now scientists have found evidence for another adage: Rain follows the full and new phases of the moon. Most studies on the weather and moon phases appeared in the 1960s and seemed to lend credence to lunar folklore. Researchers detected more peaks in rainfall in the days after the full and new moons, for example. Recently, three researchers decided to revive the issue when they stumbled across a link between moon phases and stream runoff while working on another project. They will soon publish in Geophysical Research Letters one of the most comprehensive studies yet, with more than a century of data from across the continental United States. The researchers, a team comprised of geographers and climatologists from Arizona State University (ASU), Tempe, and the National Climatic Data Center (NCDC) in Asheville, North Carolina, ...turned to the U.S. Historical Climatology Network, a database with daily precipitation information for more than 1200 stations from as early as 1895. True to farmers' wisdom, precipitation tended to rise a few days before the quarter moon. It's not a strong link. .. But they do seem to account for 1% to 2% of the total changes in rainfall or stream runoff. "It's a real effect, but it's a real small effect," Thorne says. <<When the moon is high in the sky, it creates bulges in the planet’s atmosphere that creates imperceptible changes in the amount of rain that falls below. New University of Washington research to be published in Geophysical Research Letters shows that the lunar forces affect the amount of rain – though very slightly. “As far as I know, this is the first study to convincingly connect the tidal force of the moon with rainfall,” said corresponding author Tsubasa Kohyama, a UW doctoral student in atmospheric sciences. Kohyama was studying atmospheric waves when he noticed a slight oscillation in the air pressure. He and co-author John (Michael) Wallace, a UW professor of atmospheric sciences, spent two years tracking down the phenomenon. Air pressure changes linked to the position of the moon was first detected in 1847, and temperature in 1932, in ground-based observations. An earlier paper by the UW researchers used a global grid of data to confirm that air pressure on the surface definitely varies with the position of the moon. “When the moon is overhead or underfoot, the air pressure is higher,” Kohyama said. Here's my favorite human image in the moon, because it is so anatomically correct. After you see this, it's hard to see the "man" in the moon (I hope this link will work). Why yes, I do have a favorite object that I see in the moon! In September 2014 I photographed Nessie (the famous Loch Ness Monster) hiding in the crater Ptolemeus. She only comes out to play for a short time each month. Well, I see a monad in the moon. It jumps out at you during a gibbous waning moon, and it works in either hemisphere. What changes of course is whether light or dark is "up." The image (to me) appears to be a man [in profile] wearing funky sunglasses, sporting a polka-dotted shower cap of some sort; with a button nose and a slight "almost" smile...you can clearly make out his upper lip and chin. To his right, you can see the end of a rolled-up Torah, held up close to the side of his face. I think God has a good sense of humor, in light of what that face has had to behold on the Earth over the last 4 billion years---but especially in the short time-span that mankind has been running amok upon it. I still see Jackie Gleason from the intro of The Honeymooners. Man in the Moon is OK....but now I see....THE ENERGIZER RABBIT!!!!! An English friend showed me how to see St George Slaying the Dragon. I've been aware of a poodle for decades, but not of the astronaut.